Flexible Logo Brettenbach – Ni" Jeanette Flick, design. Recently, a Raven is living on top of the lettering of Brettenbach Kommunikationsdesign. Friends were telling the story of a Raven who took over their balcony. While they stayed abroad for the winter, he checked in, inspected it and decided to stay. 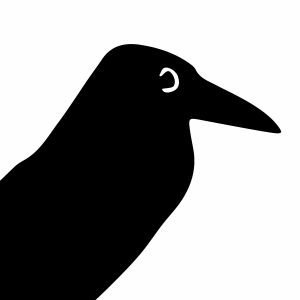 Now the logo of the design agency Brettenbach is also occupied by a raven. He is able to move across the lettering. He jumps from letter to letter and flies away whenever he likes to. Flexible identity in .raven format. Ravens are very communicative characters. Besides they like to collect shiny things which are reflecting the sunlight. ni”s part: logo design, illustration.